VANCOUVER (NEWS1130) – Music, dancing, and bright elephant ear hats made this flashmob look like a party. 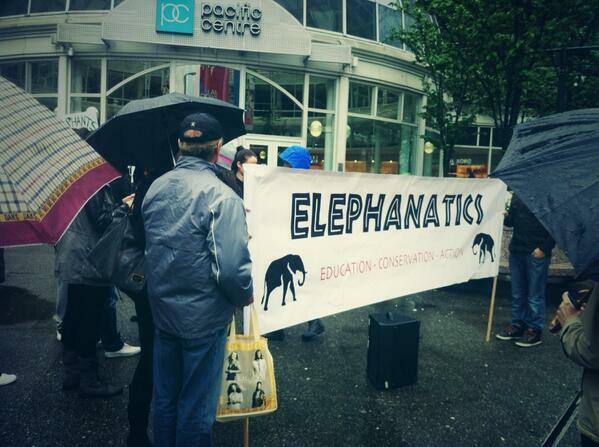 But the group got together in front of Pacific Centre mall downtown to bring awareness to a serious issue – the elephant poaching crisis in Africa. The animal advocates call themselves Elephanatics, and they believe educating consumers on the cruelty of ivory poaching is the first step. Organizer Andrea Duthie says a flashmob is a fun way to turn heads to this serious issue. “We thought it would be a fun way of approaching the situation, and educating people, getting people dancing, and involved, and having fun,” says Duthie. While this is not a local issue, Duthie hopes educating people in Vancouver on the cruelty of poaching methods will stop them from buying products made out of ivory. “They’re killed for their ivory tusks, which are made it into trinkets, and it’s a really big problem, and we feel very passionate about it, and we just wanted to educate the public,” she adds. Duthie says if poaching continues at the current rate, all elephants will be extinct in a decade. This article originally appeared on News1130 on May 4, 2014.